Place the flour in a large non-stick skillet and heat over medium-high heat. Watch the pan carefully, stirring and shaking the flour. It will take about 10 to 15 minutes and the flour will turn an almond brown. Do not let the flour cook too fast or burn. Remove to a plate and cool. While the flour is cooling place the butter and olive oil in the pan over medium heat and add the minced garlic. Cook, stirring frequently, until it softens. Add the onions, celery, green and red peppers and cook until the peppers are slightly soft. Sprinkle about 1/4 of the cooked flour over the top of the cooked vegetables. Stir to blend the flour and repeat with the flour in three more batches until it is fully incorporated and there are no clumps of flour. Add the water slowly stirring continuously. The sauce will begin to thicken. Stir in the salt, pepper, cayenne pepper, bay leaf and Cajun spice. Cook slowly adding water a tablespoon at a time if the sauce is too thick. Add the tomatoes, sherry, parsley and thyme. The sauce can be made to this point and kept warm or overnight. When ready to serve heat the sauce and add the shrimp. Cook until they are pink and firm. Serve over rice and top with the chopped green onions. 146 members have added this recipe to their cookbook. Great flavor! I love this recipe, I didn't use the shrimp when I made it. Nice and spicey without being too hot. 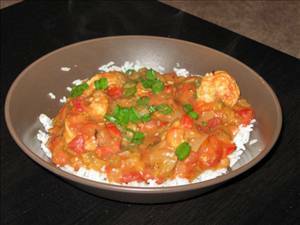 There are 297 calories in 1 serving of Low Fat Shrimp Etouffee. Calorie break-down: 19% fat, 43% carbs, 38% protein.